Impact Armor Technologies began in 2006 as a producer of high purity alumina ceramics for use as strike faces in heavy armor applications. At that time our research focused on developing protection for high threat level military applications. During this time we honed our ceramic production skills and developed unique shapes and recipes to reduce cost and weight. 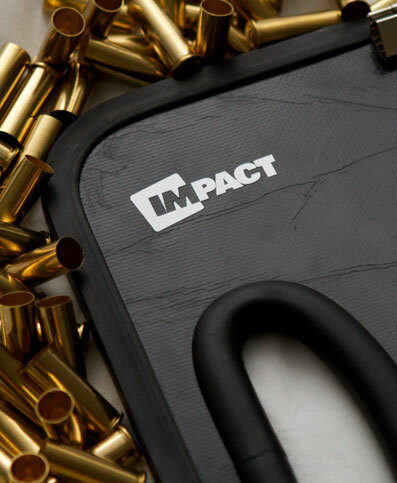 Impact also built then expanded our testing range to accommodate larger calibers including 14.5mm, .50cal, and high speed 20mm canons which was sued to provide immediate feedback on new design and concepts. We also produced armor to protect against blast threats like IEDs and EFPs, designing our own EFP surrogates which were used to test protection concepts on over 300 occasions. From this research Impact began expanding manufacturing capacity. In addition to ceramic processing Impact began researching structural composites and spall liners, eventually establishing the production of both in house. Complete solutions were able to be designed, tested, and evaluated without leaving the building. This provided a unique opportunity to wholly develop a solution and test it in a very cost and time efficient manner. From this dedicated research has come an integrated structure capable of the rapid development and deployment of armor systems and armor products. Impact is positioned to efficiently deliver custom armor for unique applications as well as ready-to-use products to meet a defined need. We take pride in what we do and work closely with our customers to guarantee products are delivered which meet and exceed expectations. In November of 2011 my brother, Sgt. Matthew Ruane 4th Precinct, was chasing a stolen vehicle, when the driver held his arm out of his window, and starting firing rounds at him. I was paralleling the chase and I could see the sparks from the bullet hitting his radio car. After the suspect crashed, and the suspects were secured, Matt said to me, “I could've used your clip board a couple of minutes ago!” Matt received his early Christmas present December 2011. The city I work in, I have to go through doors on a daily basis (Domestics, Shots fired, Screams for help). We do not have time to wait for the swat team to assemble. I hold my impact armor ballistic clip board in front of my head, and go through the door. I have even tucked the clip board under my arm to give me added protection where my vest doesn’t cover. I love it, and my family loves the fact that I have extra protection at my finger tips.